Hi there! 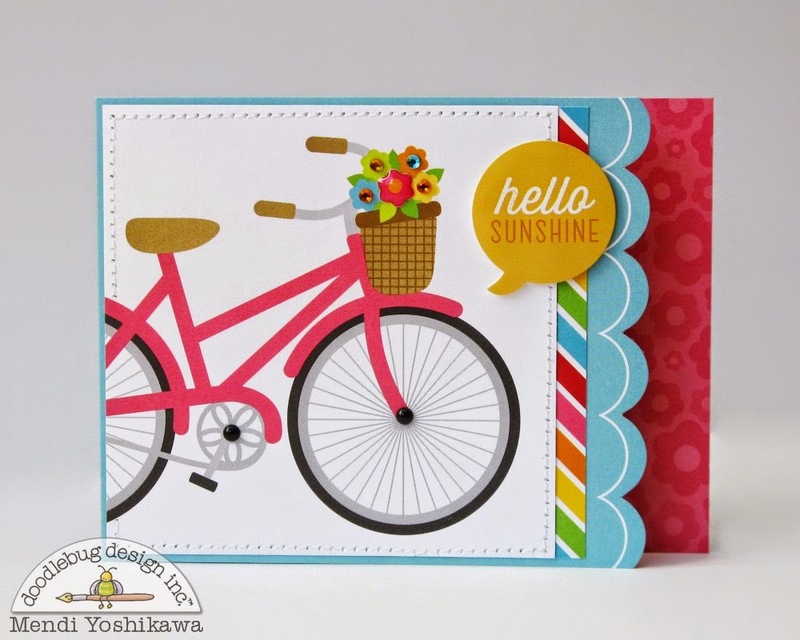 I'm popping in today with some fun projects featuring the newest Sunkissed Collection by Doodlebug. Don't the darling images and colors in this line ooze happiness?! I can't help but smile when looking at it all! I decided to create three projects to share using this happy collection, but honestly I wish I had enough time to play and make another dozen! 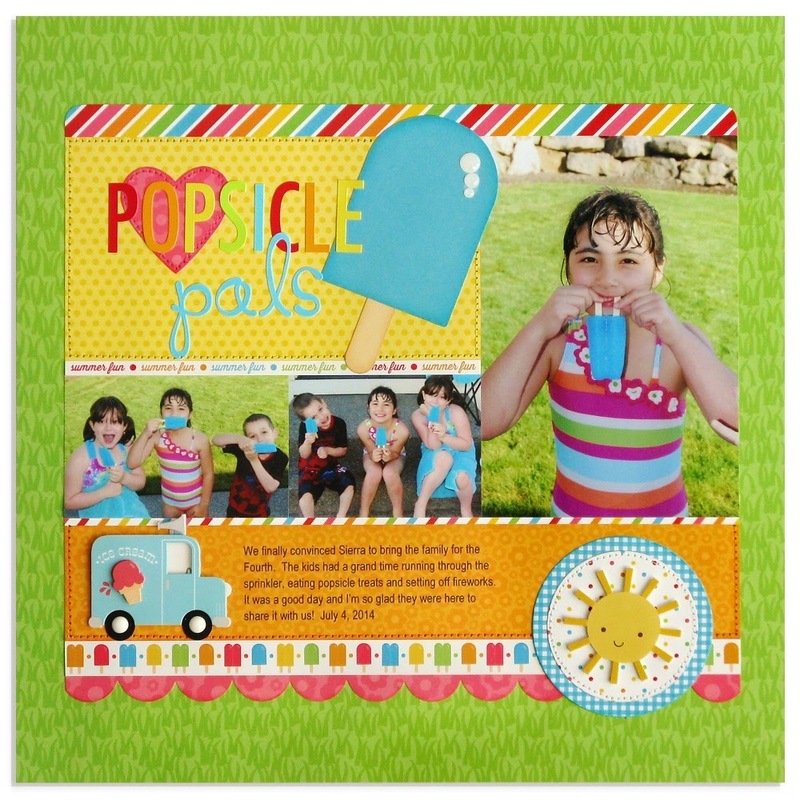 Up first I have a layout with a focus on the new Skinny alphabet cardstock stickers and the Summer Treats Craft Kit. I was immediately taken with how well they matched some photos I took of my daughter and her cousins last summer. Even the grass paper was a perfect compliment! My next project was a super quick card using a create-a-card base and a 4x4 square cut from the Surf's Up patterned paper. All I did was use a simple stitch around the square, a small strip of rainbow paper and some embellishing with a sentiment sticker and some sprinkles and jewels. I love the big impact this has with so very little effort! LOVE all of these Mendi! The pics are perfect for this collection, and your cards are adorable. Love your layout and cards, Mendi! 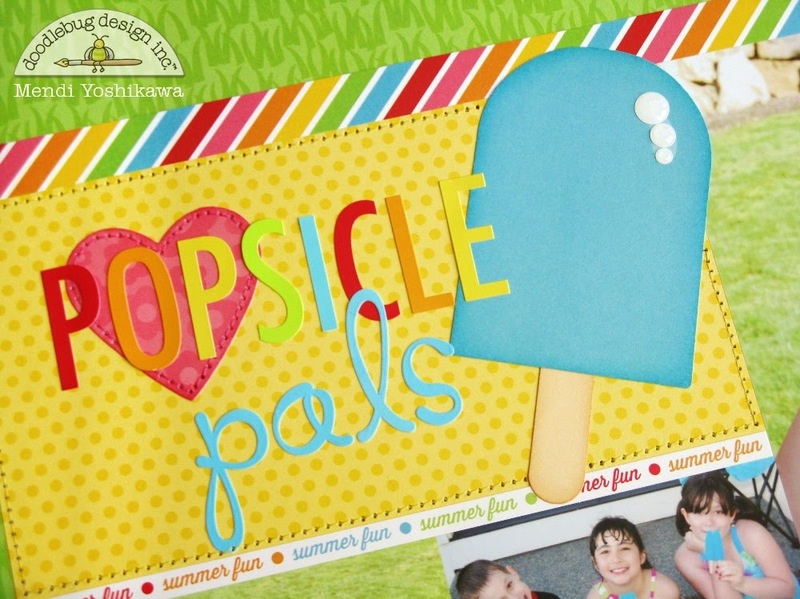 Popsicle Pals. What a great idea. ASTOUNDING, AMAZING, and SO CUTE!!! Love the cards and the layout is SO COOL!!! What a fun job you have done on those cards - turned them and given them a new look!! I just love when Mendi creates - she always pleases and makes something to impress!! Beautiful projects!!! Love them Mendi!!! WOW - the bicycle is DELIGHTFUL, especially with the bling flowers in the basket!! !